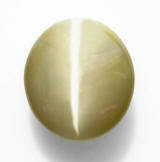 Like the eye of a cat or a panther, chrysoberyl cat's eye seems almost supernatural in origin. How could something so feline be mineral and not animal? Cat's-eye is a variety of chrysoberyl which has a distinct band of light across its face, which sweeps from side to side. It is recognized in all ancient cultures as powerful talisman that can direct fortune. 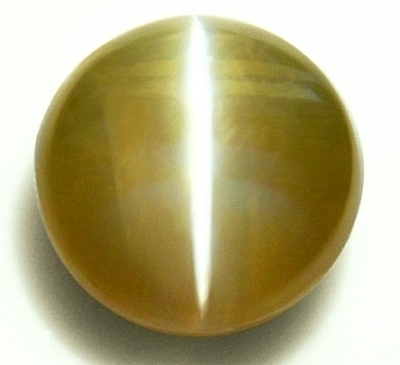 In Jyotish, chrysoberyl cat's eye is the Jyotish gem related to Ketu (the moon's descending node) which is a shadowy entity called Moksha Karaka or "planet of enlightenment". It empowers spiritual tendencies, asceticism, non-attachment and psychic powers as well. It is related to ghosts, spirits and astral forces. Wearing a cat's eye of at least 1.5 carats is said to exalt spirituality and psychic ability, and protect from mysterious dangers and diseases. It brings fortune to gamblers. 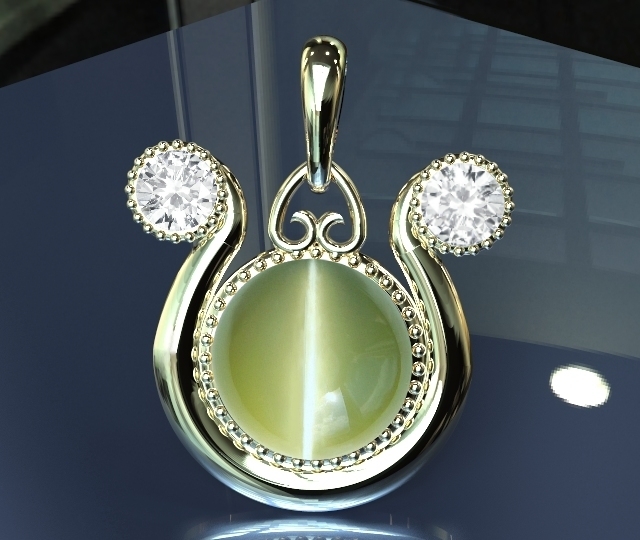 A chrysoberyl cat's eye can be substituted with cat's eye tourmaline or cat's eye opal of at least 4 carats. If you want to know more about the gemological and astrological-healing properties of cat's eyes, click here. 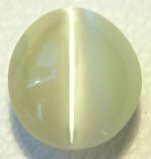 Very unique color, perfectly clean, entreated, Brazilian cat's eye. 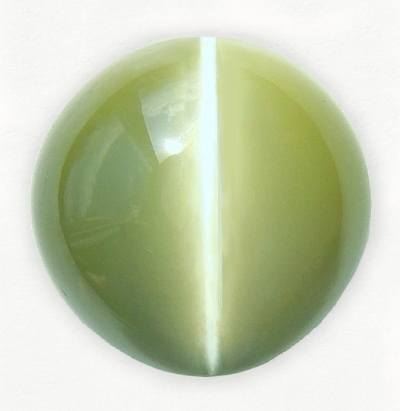 This is a cat's eye chrysoberyl we picked from a Brazilian dealer, and friend. It weighs 2.67 cts., medium, teal green color, (bluish-green), good, elongated, oval cabochon cut, and measuring 9.25 x 5.90 x 5.17mm, completely clean crystal with no internal cracks, great transparency, with fair and straight white eye, from the Minas Gerais area, Brazil. Awesome metallic green color in a very transparent and clean body, voided of any crack and imperfection. Not a super sharp eye, but still very defined and straight eye, this is a fantastic cat's eye chrysoberyl to enhance the favors of Ketu in your life. Absolutely gorgeous, perfect gem, great size, untreated, Ceylon cat's eye. Very good one. 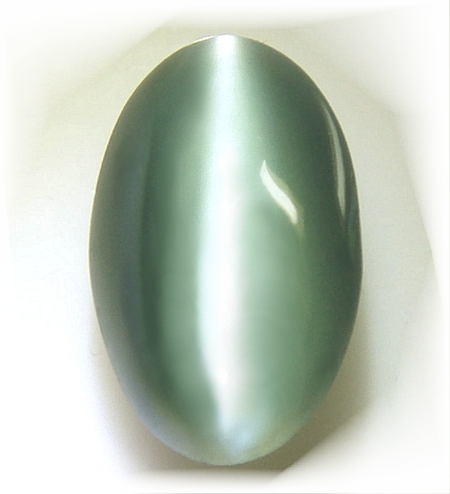 This is a superb, Ceylon "noble" cat's eye, weighting 4.01 cts., pastel, metallic green color, masterly executed, oval cabochon cut (with flat, polished bottom for easy setting), and measuring 10.11 x 8.58 x 4.44mm, clean with no internal cracks, and displaying a finest, razor sharp and centered white eye, mined in the Lellopitiya area, cut and polished in Ratnapura, Sri Lanka. What gorgeous cat's eye. If you want the very best, large face stone with truly the best requisites in a cat's eye gem, consider this one. Amiable, very well shaped for large appearance, good eye, untreated, Ceylon cat's eye. An auspicious and surely captivating, untreated, Ceylon, cat's eye chrysoberyl this one, weighting 2.85 cts., medium, "parrot" green color, well shaped, round cabochon cut (with flat bottom and large face), measuring 8.62 x 8.02 x 4.50mm, good transparency, with fine, sharp and centered, white-bluish eye, from the gem fields of Ratnapura, Sri Lanka. A real nice, chrysoberyl cat's eye that is well cut for large appearance and possesses a strong Ketu energy. Great for a Vedic ring, either for the gents or ladies. Perfection, in shape, great eye and clean body, untreated, Ceylon cat's eye. 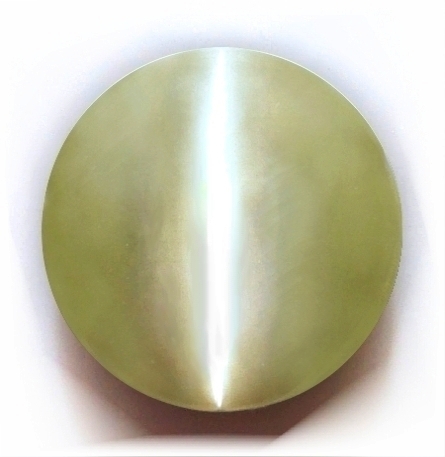 Here is a beautiful, simply perfect chrysoberyl cat's eye, weighing 1.38 carats, pastel, "metallic" green color, perfectly shaped, round, cabochon cut, and measuring 6.52 x 6.38 x 3.43mm, perfectly translucency, super clean with no cracks, and displaying a fine, sharp and centered white eye, mined in the Elahera area, cut and polished in Ratnapura, Sri Lanka. Absolute perfection. Great for anything you want it to. 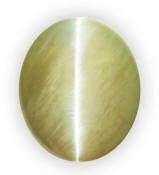 Chrysoberyl cat's eye is very hard (8.5 on the Mohs scale) and allows for a daily wear jewel. This will attract the benevolence of Ketu. Or simply will attract everyone to it. Ketu, astrological sign pendant talisman. Set yourself apart. We can set any of the cat's eyes available in this page in a custom, Ketu astrological sign talisman. Here is a sample with 4mm, flawless, Ceylon white sapphires. The granulation technique you see around the center stone and the white sapphires accents originates from an ancient Balinese, silversmithing technique, where the surface of a piece of jewelry is decorated with small dots or granules of the same precious metal, arranged in a pattern, making the piece unique and attractive. Absolutely beautiful, propitious & unique, this is a high quality, Ketu talisman, that can be custom crafted in any carat gold and with any center cat's eye available. Ask for it. 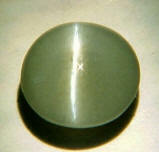 Seductive, perfectly shaped and of good size, untreated, Ceylon "noble" cat's eye. Excellent quality, Ceylon "noble" cat's eye weighting 4.12 cts., fine honey color, perfectly shaped in round cabochon cut (with perfect flat bottom for easy contact with skin), measuring 8.50 x 8.43 x 5.59mm, perfect translucency, with sharp and straight, centered, white eye, hailing from the Kuruvita area, cut and polished in Ratnapura, Sri Lanka. We re-cut slightly the bottom, and made it perfect. Cat's eye and star stones have almost always the bottom lumpy and imperfect, being part of the original rough surface. Not always easy to set especially when you need to have the bottom touching the skin for Vedic, astrological purposes. This one is just perfect, and offered at a great price for the quality being. 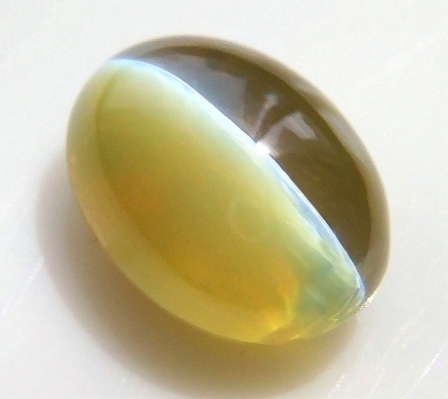 Magical, unlike any other, cut for very large appearance, unique, untreated, Ceylon cat's eye. This is one is impressive!. A Ceylon "noble" cat's eye weighting a great 6.15 cts., medium "metallic greenish" color, masterly cut in a cabochon, oval shape and measuring 12.7x11.37x4.83mm, eye clean, with very good, centered & straight, white eye from the gem fields of Ratnapura, Sri Lanka. Wow, such a majestic & unique cat's eye, cut for large appearance (low dome and virtually flat bottom), displaying a "face" (or visual dimensions) of a 12-14 cts. stone, but without the price associated with that high carat weight. Majestic and huge cat's eye, with magical eye appeal, priced at ridiculously well below, wholesale price. Absolutely unique, beautiful & powerful, untreated, Madagascan cat's eye. Auspicious. A most awesome cat's eye chrysoberyl hailing from Madagascar, weighting 3.40 cts., medium-dark, "bamboo" green color, with finest, ultra sharp, centered, white eye (the best eye), masterly executed, round cabochon cut, and measuring 8.90x8.80x4.58mm, internally clean, from unknown mining area, central highlands, Madagascar. Low dome, large face, round shape, ultra-sharp eye, mystical color, no internal cracks, make this cat's eye a very powerful one. Really, really beautiful, this gem will make an auspicious astrological ring to propitiate the favors of Ketu. Offered at a great price for this fine quality. Beautiful, awesome straight eye, good size, Ceylon cat's eye. Under priced. Gorgeous shape in this Ceylon cat's eye. 2.50 ct., pastel, metallic green color, excellent roval (roundish oval) cabochon, measuring 7.5x6.9x 5.4mm, top translucency, eye flawless from Ceylon. Another gorgeous cat's eye, with a predominant greenish color, with a razor sharp, centered, white eye, floating as the stone is tilted to different light sources. Affordable for a top clarity gem. Untreated. Absolutely fabulous, great size, gem quality, Ceylon "noble" cat's eye. For a very fortunate person. This is a gem quality, Ceylon "noble" cat's eye for someone that wants the very best. It weights 5.26 cts., medium-dark, brownish-green color, masterly executed, oval cabochon cut, measuring 10.81x8.47x5.94mm, perfect translucency (milk & honey effect), free from internal cracks and inclusions (eye flawless) with finest, ultra sharp, centered, white-yellow eye, from the gem fields of Ratnapura, Sri Lanka. This is the very best in chrysoberyl cat's eye in a 5+ cts. oval cabochon. Top honey color, razor sharp and centered eye and most of all the perfect translucency only found in gem quality stones. Destined to a very fortunate person that wants the very best! Rare at this low price.